Many see Romney’s staunchly pro-Israel stance as a political play for the Jewish vote, both in America, and in Israel (there are some 250,000 American citizens living in Israel and the vast majority of those voted for John McCain in 2008). Romney was also clearly after some Israeli campaign cash; the candidate raked in $1 million dollars from just 45 donors at his fundraiser on Monday. But, we don’t need to read between the lines of Romney’s remarks in Israel to also locate a theological dimension to his support of Israel. 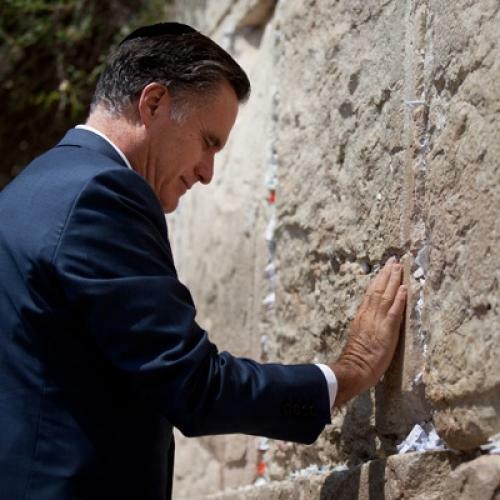 Along with American evangelicals, Mormons like Romney have long been hawkish on the Jewish state, as well as frequent visitors to the Holy Land, making pilgrimages to sites like the Western Wall, Mount of Olives, and the Garden of Gethsemane. Mormons share with many Christians and Jews a belief that Israel is an integral part of their own biblical-era past and humanity’s inevitable apocalyptic future. But it’s precisely their theological and social differences from other religions that require Mormons, including Romney, to negotiate a number of pitfalls whenever they are in Israel. Yet, as Israel’s import in Mormons’ vision of the future has decreased, Mormons have taken a greater interest in connecting with the Holy Land’s past. Beginning in the 1970s, the LDS Church worked to create a permanent a home of its own in Jerusalem. In 1979, Mormon President Spencer W. Kimball made his own pilgrimage to Israel and dedicated the Orson Hyde Memorial Garden on the land, overlooking the Garden of Gethsemane, where the Mormon apostle had prayed for the Jews to return to Israel 138 years earlier. And in 1984, Brigham Young University began constructing a satellite campus in Jerusalem, which would allow young Mormon college students to study scriptures in the land where they believed the ancient events actually took place. Yet many Israelis, in particular, the country’s Jewish Orthodox population, objected to the LDS Church constructing a permanent center in what they consider their divinely established capital, seeing it as an effort by the Mormons to gain a foothold in Jerusalem—already the world’s most contested religious real estate. The LDS Church promised the Israeli officials that none of its students or faculty would proselytize in Israel, even requiring the students to sign a “non-proselytizing agreement.” Nevertheless, when the BYU Jerusalem Center for Near Eastern Studies opened in 1987, thousands of Orthodox protested outside. Fox, who like Romney, also placed a prayer note in the Western Wall during his time in Jerusalem, says the Center’s curriculum and overall approach to Jerusalem was about history and faith, not about the “Second Coming” or the politics of Americans’ relationship with Israel. Some in Israel continue to be wary of the LDS Church’s intentions toward the Jews. These fears have repeatedly been exacerbated by the fact that a handful of Mormons have continued to perform proxy baptisms for dead Holocaust victims, despite a promise made by Church leaders in 1995 to cease such activities. Despite all the potential theological and social tensions, Mormons visiting Jerusalem recently have managed to integrate themselves as well. As Hillary Kaell, an expoert on Modern American pilgrimages to the Holy Land, explains, “Because they dress like other Americans and speak English with an American accent… Mormons blend with the other Americans visiting the holy land sites,” which Kaell says hundreds of thousands of Americans undertake each year (of which perhaps some 5 percent are LDS). “The groups, whether they’re Mormon or evangelical or Catholic, don’t really interact with each other or with the locals. So there’s really not a lot of debates about Jerusalem’s place in the apocalypse,” explains Kaell. Still, even if Mormons and evangelicals don’t talk to each other when visiting the Jewish state, many Mormons and evangelicals increasingly speak the same language about the Holy Land. There is less talk about Christ’s return, and more talk about the secular apocalypse they believe a nuclear Iran represents. Romney’s Jerusalem audience rewarded such talk with a standing ovation. But perhaps more importantly for Romney’s presidential aspirations, so did the evangelical voters he’s courting back home. Max Perry Mueller is a Ph.D. candidate in the Study of Religion at Harvard and associate editor of the online journal Religion & Politics.